Fouquieria splendens, or Occotillo is a large shrub growing 10 feet tall or more. The Occotillo is one of the plants that is used to separate the Low Desert region from the High Desert in Southern California. Fouquieria splendens is a great nectar source for bees, hummingbirds and a number of butterflies. Occotillo blooms in the Spring or late Winter and will repeat if there is enough Summer Monsoonal moisture . Occotillo is Winter hardy into the low 10°s F but will likely be damaged if temperature drop below 20°s F. In the garden Fouquieria splendens will require good drainage, either by planting on a slope or by using well draining soil in a raised bed or container. When drought stressed the plants will lose their leaves but rapidly grow new ones when water becomes available. Occotillo is easily overwatered. 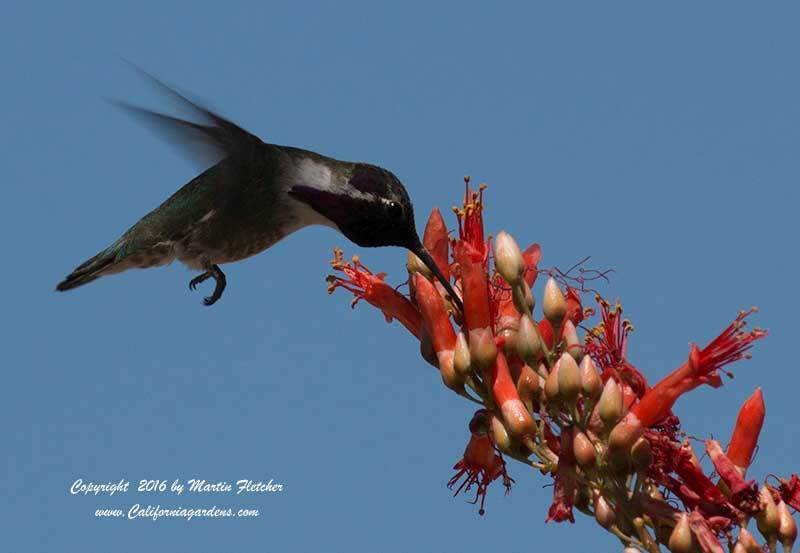 Costa's Hummingbirds are an important pollinator in the desert. A Costa's Hummingbird visits the red flowers of Fouquieria splendens - Occotillo. High resolution photos are part of our garden image collection.